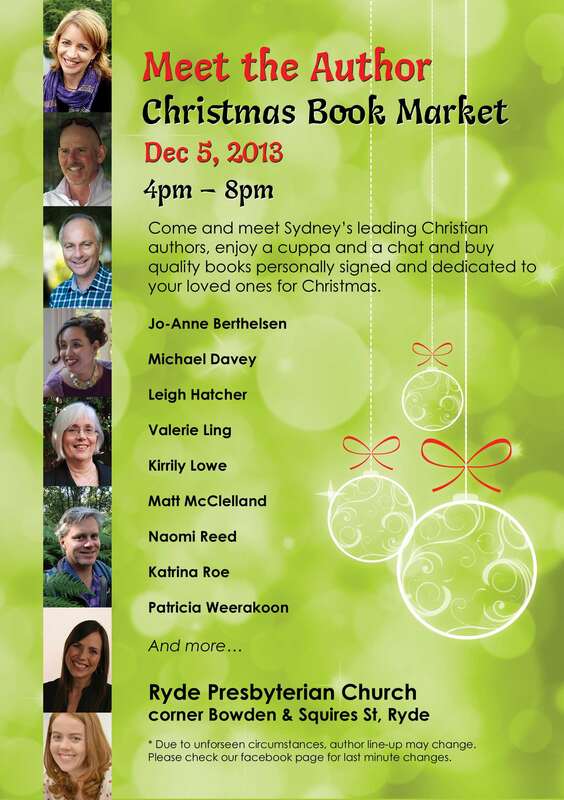 Once again, our friends at Ryde Presbyterian Church are hosting our annual Meet the Author Christmas Book Market. As well as the author’s listed below, Julie Mallinson, Justin Theng and Maureen Bartlett will be on board, with more Christian authors being added daily! Trust me, it’s getting hard for me to keep up, everybody wants to be there! As well as Marty’s Nut-Free Party and my other books, I’ll be selling a very select range of children’s books from my favourite Wombat Books authors. Other authors will be selling fiction, non-fiction, biography, bushwalking guides, inspirational books, poetry and more children’s books. Please pop in and say hi. Bring cash with you because there will be some wonderful treasures for your family and friends, but most of the authors won’t have card facilities on hand! I look forward to welcoming you there!